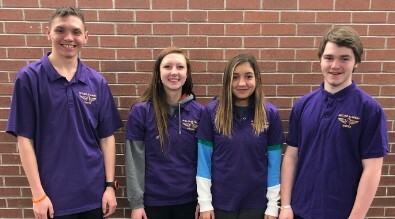 This February, four Skyline students have a unique opportunity to attend the National Dropout prevention conference in Myrtle Beach, South Carolina The students will present a 90-minute workshop on how to build relationships through student engagement. Participants in the workshop will be engaged through an interactive workshop and discussion on how the school reduced dropout rates and increased attendance through mentoring, community outreach, and soft skill development. 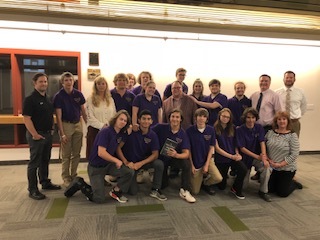 On May 30, 2018, Skyline students hosted Christian Moore, author of "The Resilience Breakthrough." Students were able to meet the author, and he presented personal aspects of his life and how the positive and the negative contributed to who he is today. 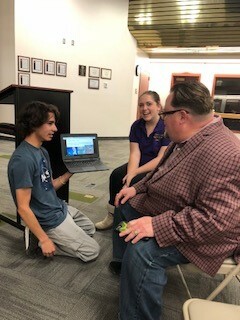 Mr. Moore takes a moment to sit with Samantha Green and Jace Haight to listen to their presentation of his book "The Resilience Breakthrough."